Emma Bachali, junior biblical and theological studies major, enjoys the annual Night to Shine event with her guest Brenna Brown. Junior Johnny Cummings, junior public relations major and Spanish minor, is paired with guest Gabriel Casiano, who recently moved with his mother and sister to Hollister, Missouri, from Puerto Rico. Junior Andrew Ferkel, business administration major, enjoys watching his guest Tyler Grady come out of his shell throughout the evening. POINT LOOKOUT, MO. 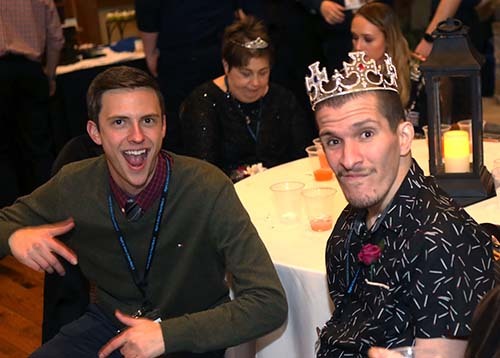 — College of the Ozarks hosted its annual Night to Shine event, in conjunction with the Tim Tebow Foundation, tonight, Friday, Feb. 8, 2019, in the Silver Dollar City Parlor at The Keeter Center. The prom-like event provided an evening to remember for 100 guests with special needs from Stone and Taney counties. More than 250 College of the Ozarks faculty, staff, and students volunteered — helping with hair and makeup, providing shoe shines, greeting the guests as they entered on the red carpet, and serving as “buddies” or chaperones, for the entire evening. 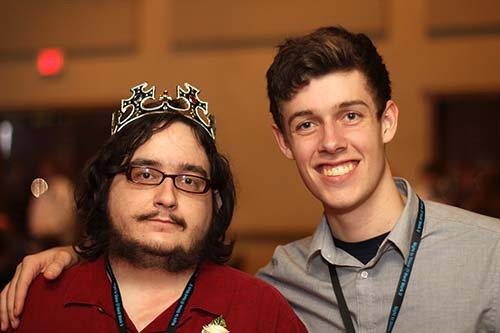 Night to Shine is a worldwide movement that is transforming Valentine’s Day weekend into a celebration of God’s love of people with special needs. Junior Emma Bachali, biblical and theological studies major, was paired with Brenna Brown. Junior Andrew Ferkel, business marketing major, was paired with Tyler Grady. Junior Johnny Cummings, public relations major and Spanish minor, was paired with Gabriel Casiano, who recently moved with his mother and sister to Hollister, Missouri, from Puerto Rico. Casiano understands only Spanish, and he does not respond except by nodding his head, snapping his fingers, and breathing heavily when he is happy. Cummings and Casiano became fast friends, despite the communication barrier. Casiano is sensitive to loud noises and crowds, but with encouragement from his sister and Cummings, he went over to the outskirts of the prom party, and the three of them danced while remaining seated. Guests for this year’s invitation-only Night to Shine event were chosen with the help of several agencies in Taney and Stone counties that provide services to people with special needs. After the special guests were pampered with VIP treatment in the Alumni Center, they were taken by limousine rides to The Keeter Center. Crowds of cheering students welcomed them as they walked on a red carpet from the parking lot all the way to the ballroom. 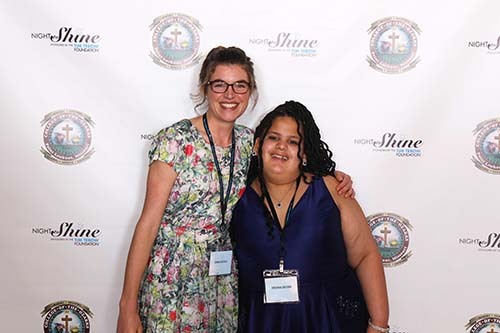 Raeanne Zurn, New Hope Development and Cedar Creek director, has participated with a group of special guests all five years the College has hosted Night to Shine. Tebow is a two-time national champion, first round NFL draft pick, and Heisman trophy winner. Tebow played three years in the NFL for the Denver Broncos, New York Jets, and New England Patriots. He grew up the son of missionaries, and even after moving to Florida as a child, he returned to the Philippines as a teenager — to spread God’s word, and do the Lord’s work, by serving the needy. He carried that calling with him to the University of Florida, where in addition to leading the Gators to two national championships and winning the Heisman Trophy in 2007, he also devoted himself to charity — raising money for pediatric cancer patients and disadvantaged children.